SAMe (S-Adenosyl-L-methionine) is a derivative (the primary metabolite) of the amino acid methionine. This compound is present in all human body cells and participates in more than 40 different biochemical reactions in the body. Its principal function is methylation, a biochemical process producing compounds vital for cartilage formation, neurotransmitter synthesis, cell membrane functioning and neutralization of toxic substances. SAMe is also essential for keeping mood swings under control by increasing dopamine and serotonin levels. Although SAMe is present in all our body cells, its concentration decreases with age. Too drastic a decrease can cause all kinds of disorders, such as clinical depression, osteoarthritis and different liver diseases. SAMe treatment has been used for over 25 years and much clinical experience has accumulated, in particular regarding its use as an anti-depressant and as an efficient drug against osteoarthritis, rheumatoid arthritis and different liver disorders. There is also evidence that SAMe is effective in the treatment of fibromyalgia, premenstrual syndrome, ADHD, etc. SAMe was found to be very effective in the treatment of most depressive disorders, from different degrees of clinical depression to premenstrual tension (PMT) and middle age-related depression. It is as effective as regular antidepressants, but without causing the adverse drug effects and risk of addiction associated with taking antidepressants. Its activity is based on its methyl-donor properties and resulting methylation processes in the brain, leading to the synthesis of mood balancing and mood elevating neurotransmitters. The antidepressant activity of SAMe has been extensively studied. Analysis of the results, carried out at the psychiatric department of the Medical School of the Catholic University "Sacro Cuore" in Rome, showed that SAMe was 17%-38% more effective than placebo in the treatment of depression, and as effective as tricyclic antidepressants, without causing the adverse drug effects associated with taking these drugs. Another study showed that SAMe plays a role in the synthesis of neurotransmitters in the brain and that it was as effective as the tricyclic antidepressants. It was also found that SAMe acts synergistically with and faster than these drugs. This study also demonstrated that SAMe is a very safe antidepressant drug. In another, double blind, study the effect of SAMe on postmenopausal depression in women was studied. Starting from the tenth day of treatment there was a significant improvement in the condition of the SAMe treated women compared to the placebo group. Research showed that SAMe is one of few compounds that can significantly ease symptoms of the disease, such as pain, tiredness and depression. In a double blind study of 44 patients with primary fibromyalgia, the effect of a daily dose of 800 mg was measured compared to placebo. After six weeks a decrease in pain, tiredness, morning stiffness and depression was observed, in addition to improved muscle functioning. There was no difference in adverse effects between the two groups. 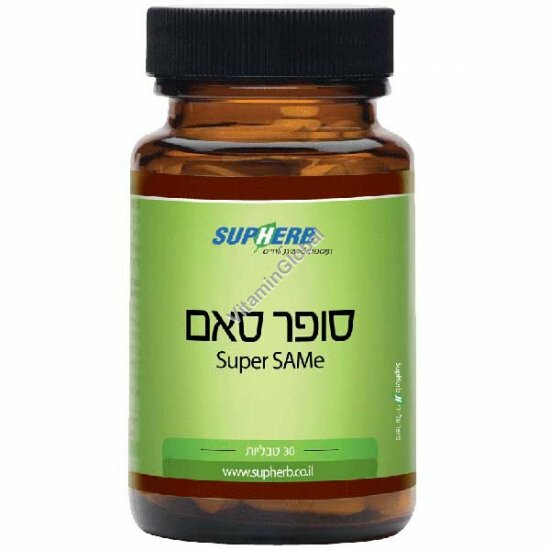 The beneficial effect of SAMe is manifested in the significant easing of the disease`s symptoms, in particular by acting as an antidepressant and painkiller. In this disease, SAMe acts as a painkiller and anti-inflammatory drug. Similar to the non-steroidal anti-inflammatory drugs (NSAID`s), SAMe plays an important role in cartilage formation and is therefore indispensable for the treatment of osteoarthritis. In an open study, 108 patients with osteoarthritis of the knees, hips and skeleton participated for 24 months. The patients received a daily dose of 600 mg SAMe, divided in 3 tablets of 200 mg each. After two weeks the dose was decreased to 400 mg (2 x 200 mg) until the end of the study period. The severity of clinical symptoms, such as morning stiffness, pain at rest and during motion, etc., was evaluated separately for each symptom. The effect of SAMe was checked after two weeks of treatment, followed by every month until the end of the study. Already after the first examination an improvement in the patients` condition was observed, which continued during the entire study period (2 years). There was no evidence of any specific adverse events or pathological changes. At the same time there was an improvement in depressive symptoms often accompanying this disease. From a summary of studies including 22,000 patients over a period of 5 years it is apparent that the effect of SAMe in the treatment of osteoarthritis, particularly its effect as a painkiller, is similar to that of NSAID`s, without the adverse drug effects accompanying the latter. SAMe is a vital supplement for the treatment of all liver problems. As a methionine derivative, SAMe inhibits hepatic fat accumulation and helps to eliminate excess fat from the liver, thereby improving hepatic functioning. Several studies showed the effect of SAMe in eliminating estrogen, excess fat and toxic compounds, including alcohol, from the liver, and its effect on various liver diseases. Nevertheless, SAMe should not be used indiscriminately and its use should be carefully considered in each specific case. A recently published study showed the usefulness of SAMe for treatment of liver diseases that impair the production of the enzyme SAMe synthetase, which catalyzes the formation of methionine to SAMe in the metabolism of nucleic acids. SAMe is vital for all body cells and replaces methionine in liver diseases. The production of SAMe synthetase is reduced by 50% in patients with liver disease. Because SAMe increases the synthesis of glutathione, it is vital for the neutralization of toxins, free radicals and byproducts of hormonal metabolism, including the elimination of excess estrogen, which is one of the factors in the appearance of premenstrual syndrome (PMS). SAMe plays an important role in alleviating allergic reactions by neutralizing histamine, which is involved in allergic reactions to food and inhaled substances. In addition, it was found that SAMe acts against certain disorders connected with excess histamine levels (certain cases of schizophrenia and depression). * No special adverse drug effects have been reported as a result of taking SAMe. Research has shown that SAMe accelerates the effect of the antidepressant imipramine. In a study of 63 depressive patients, in which one group received 200 mg SAMe i.m., a significant reduction in depressive symptoms was found in the group receiving combination treatment with imipramine and SAMe (12). Manic-depressive patients should not take SAMe without medical supervision, because the compound may induce mania. Recommended dose: 1-2 tablets per day with meals. (Taking before bedtime not recommended for persons with sleeping problems).